JetBlue’s Blue Inc. (previously CompanyBlue) is a corporate loyalty program and travel booking tool for small to medium-sized businesses. What is JetBlue Blue Inc.? 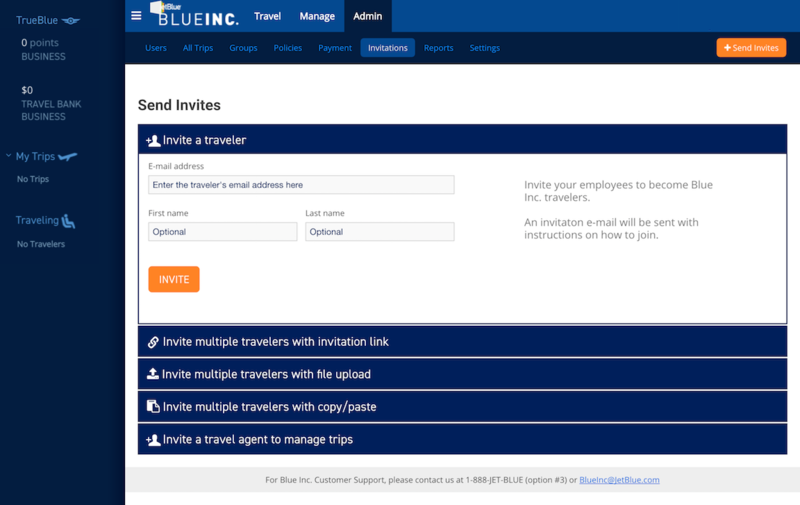 Blue Inc. is the corporate booking product and loyalty program by JetBlue. As a company, you can earn Corporate TrueBlue points on top of your employees earning their own TrueBlue points for traveling = “double dipping” on points. JetBlue is one of few airlines to keep their points program simple in that they don’t have two separate loyalty programs for individuals and businesses. Everyone earns TrueBlue points. When traveling on JetBlue, you earn TrueBlue points, and when booking corporate travel via Blue Inc, you earn TrueBlue points. This essentially keeps the earning and redemption of points much easier to understand than other corporate programs. Blue Inc. was previously known as CompanyBlue, and it’s catered to small-to-mid sized companies. You need a Federal Tax ID (EIN) to enroll in the program. How to use JetBlue Blue Inc. There are 4 types of users on the Blue Inc. platform, each with different levels of access: travelers, arrangers, administrators, and travel agents. A traveler can book travel for themselves only. An arranger can book travel for any traveler including themselves. A travel agent​­ can book travel for others, but not themselves. And an admin​­ has full access to the Blue Inc. account, can manage and invite users, has access to Business TrueBlue and Travel Bank accounts, and can book travel for themselves or anyone in the company. Whoever first enrolls the company in Blue Inc. will be the primary administrator, and you can then invite users to book through Blue Inc. so that you earn both corporate TrueBlue points and personal TrueBlue points when traveling. You can manage company policies and assign different travelers to groups that have different rules. You can store travelers’ hotel and car membership numbers so they’re added to each reservation automatically. You can also store Avis and Budget’s corporate discount numbers if you’re enrolled in their business programs. Blue Inc. allows you to store multiple corporate credit cards for travelers to use. There’s also a “Travel Bank” where any credits from changes or cancellations will accumulate and allow travelers to use if the Travel Bank exceeds the cost of the booking (no partial payments). You can generate travel reports to look at key metrics for your travel spend including monthly spend, top cities and top travelers. You can book hotels + cars via Blue Inc., but no corporate TrueBlue points are earned for them. Within the settings, you can disable hotels and/or cars so that your travelers are only shown flights. This is useful if you prefer to earn loyalty via another platform that will reward you for these bookings. Companies earn 3 TrueBlue points per dollar spent on JetBlue flights when booked via the Blue Inc. portal. This is on top of travelers earning a minimum of 6 TrueBlue points per dollar spent. The dollar spent is based on the base fare only, excluding government taxes/fees, travel insurance and other fees or charges. 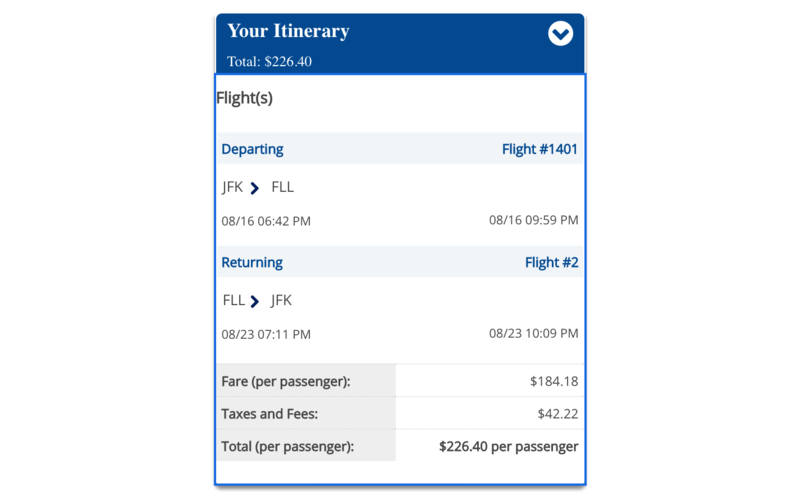 For example, if I book a round-trip flight from New York (JFK) to Fort Lauderdale (FLL), and we select the cheapest “Blue” fare for $226.40. This $226.40 can be broken down into $184.18 for the base fare (i.e. the amount you will receive TrueBlue points on) and $42.22 which are taxes and fees. As a company, you will earn 552 TrueBlue points for this flight, and the traveler will earn 1,105 TrueBlue points. If you spend a lot with JetBlue, you may consider signing up for the JetBlue Business Card. You then receive 6 TrueBlue points per dollar spent as well as the 3 points for booking via Blue Inc, on top of the 6 points earned for the traveler. TrueBlue points never expire, which is another great simplicity of the program. Additionally, if you have an Amex card, you can transfer American Express Membership Reward points to JetBlue TrueBlue points. How can I use TrueBlue points? You can redeem Corporate TrueBlue points for any traveler in your company. Any seat on a JetBlue flight can be booked with TrueBlue points, there are no blackout dates and if there’s a seat available to be paid in cash then it’s also available to be paid for with points, unlike many other frequent flyer programs. This means that it’s more of cash-back system with limited rewards though. With this in mind, in terms of redeeming points for flights, there are no better or worse ways to use your points. The amount of points needed to redeem a flight depends on the price of the flight. The cheaper the flight, the fewer points you need to redeem it as an award. Using the same example as above, flying from New York (JFK) to Fort Lauderdale (FLL) in August, the same Blue fare will set you back 14,800 points and $11.20 in taxes and fees. This works out to a valuation of 1.45 cents per point. There are other ways to use your personal TrueBlue points, including via JetBlue Vacations for a package deal that includes flights and a hotel, or for smaller rewards like magazines and newspapers. However Blue Inc. companies can only redeem points for award flights. If anyone in your company flies JetBlue regularly, then you should sign up to Blue Inc. It’s more effort because you need to set up the account and travelers have to book through it instead of via Jetblue etc. But there’s not a minimum spend requirement, you simply earn extra points for every dollar spent that can then be used to offset your travel costs. Win! You may have multiple corporate accounts set up with different airlines, hotels and cars. Enrolling in these programs can save significantly on your travel spend but they can also increase confusion and booking time among your travelers. Flightfox can manage all corporate loyalty programs on your behalf and make sure you’re accumulating all the points and rewards your company deserves, in the end saving your business time and money! Request a demo to find out more.